Is David Worried About “Blaine Damage”? Most of the endurance feats David Blaine attempts involve permanent risk to his health. His attempt at breaking the world’s record for not sleeping is no exception. Guinness World Records refuses to list this because of the risk to mental health. Asleep or awake – we just want to see a good show this year. What The Eff David Blaine? Some of the most popular YouTube videos are the David Blaine parodies. The third parody came out a couple of weeks ago and is the best one yet. Not only does the video have some great gags, but there is some interesting camera techniques for some great video magic (worthy enough to find their way into any episode of MindFreak). If you don’t find these funny, then you’re taking all of this way too seriously! This entry was posted on Monday, January 14th, 2008 at 12:28 pm	and is filed under David Blaine. You can follow any responses to this entry through the RSS 2.0 feed. Both comments and pings are currently closed. I didnt find a single thing funny in this video, wtf is that. Jesus, “comedy” gets more idiotic with every passing day. and thats if you can even call this garbage comedy. dude, that video gets funnier every time i see it. part 2 though, i found the most amusing one, that one was just sublime. so serg, go buy yourself a dictionary and look up the words comedy and humor and then watch the video again. if you still think that’s not funny after you done that, well, then you just don’t have a sense of humor. David and Chris both have good performances and are extremely talented in the field of magic and human body extreme but I think the true magician is Cyril Takyama. david, criss and cyril…..mmmm.. what a spectacular magicians.. well the 3 of them is the best magician i have ever seen appear on tv.. they have the art of perfection.. i mean,when i watch mondo magic.. i think their crazy for showing that kind of performance… very not convincing and not effective.. no offensement but mondo magic isn’t ready yet to show the world what they got.. anyways i prefer cyril takayama as one of the very entertaining and great magician, well david and criss is really great. haha, oh wait criss angel doesnt use camera magic, he can really float guys!!! why do yall hate on criss so much? the dude is a great performer…. well, Criss is known to use ALOT of camera tricks, but the performance around the camera tricks is pretty amazing. and i agree with some other people that when Criss doesn’t use camera tricks, his magic is pretty nice, but also pretty expensive. But Criss finds himself less popular with magicians all the time. Back on topic to the David Blaine thing. That video is HA-larious, I always love watching those videos. And to the “record for not sleeping” I personally think it’s one of the stuipidest things i’ve ever heard. actually, there’s a fourth David Blaine Parody out now. It’s not as good as any of the other ones but it’s kinda cool. 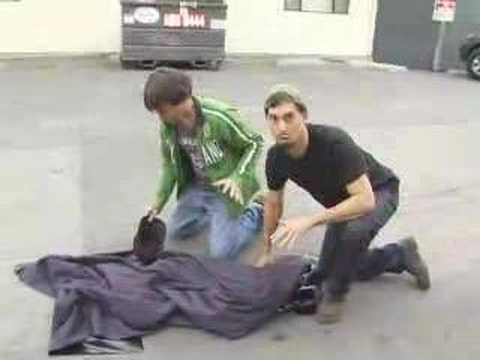 Blaine is too repetitive al his stunts a similar as much as I respect his skill, he should just make more street magic specials if he needs more money or attention.